On 20 March I spoke, together with Adam Bandt MP, at a forum in Melbourne on Global warming, Tony Abbott and the need for climate action. Close attention being paid to the efficacy of their “direct action” climate plan. Health and well-being, about increasing food and water insecurity, and the lives that children and grandchildren will face. This post is about the first part of my presentation, on connecting climate extremes that are being experienced today to an understanding of what climate change will mean for people in the future. One starting point is to make it clear that we are moving to a whole new climate that will be a new experience to people wherever in the world they live. 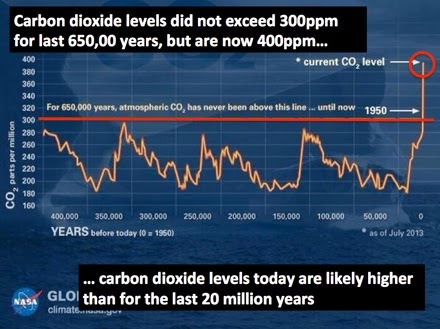 Carbon dioxide levels – the principal determinant of changing temperatures – are higher than at any time since modern human evolved, and likely higher than for the last 15 to 20 million years, so we are creating a new climate regime that humans have never experienced. Climate change manifests not as a slow, imperceptible and smooth change, but as a series of extreme events that become increasingly frequent till they become the new norm. So these extreme events – record temperatures, longer and more intense heat waves, changing rainfall and drought patterns – are all a preview of what life will be like every day in a few decades time. three days of where the average, 24-hour temperature was over 35°C (basically in the range of 28C-44°C). 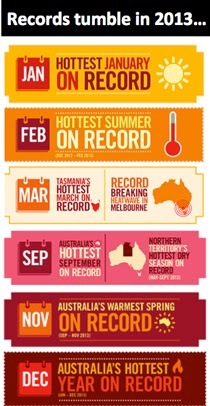 In 2013 we experienced hottest day, week, month and year on record in Australia. During the 2012-13 summer high temperature records were set in every state and territory. 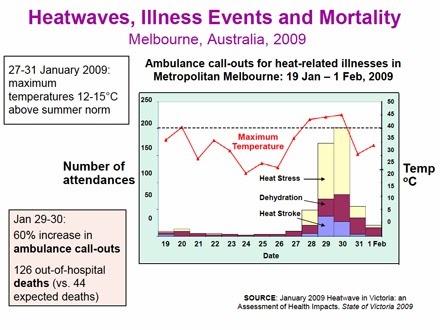 And a new Climate Council report finds that over last 30 years, Melbourne heat-waves are occurring 17 days earlier, have become 1.5°C hotter, and the maximum temperature of the hottest day is 2°C higher, compared to 1950-1980. 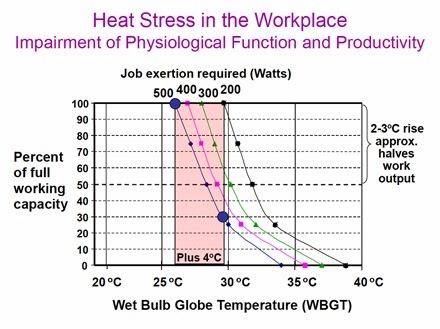 Extreme heat affects workplace productivity. As the next chart shows, for medium-exertion work, when the temperature increases from 30°C to 34°C (at 20% humidity), productivity halves. By the time the temperature is around 40°C, productivity approaches zero. The key message to communicate is that we are departing from the climate we have known, and moving to a new climate. 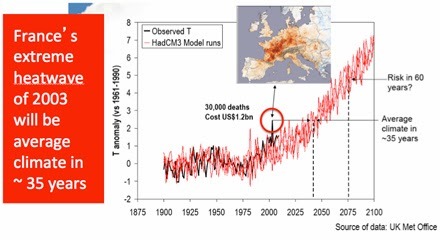 A graphic way of demonstrating this is using resources from a paper published in October last year, “The projected timing of climate departure from recent variability”. When all models are taken into account and averaged, the results for Melbourne are 2045 and 2073. To summarise, sometime from 2045 onward in Melbourne, even the coldest years will be hotter than any year up to 2005. So this is a way of showing the points of departure from the current climate regime, and the movement into a whole new higher, hotter regime. 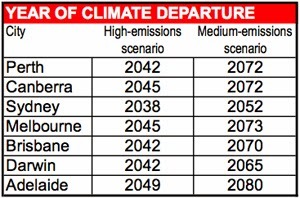 A table of climate departure years for major Australia cities is shown at right. And it is not just about air temperatures. 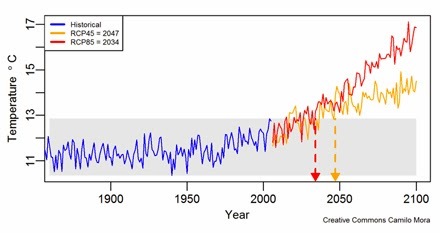 Waters around Australia had hottest sea surface temperatures on record in February 2013. In the last four years, we have experienced unprecedented and out-of-season bush fires, a record two years of rain, repeated “1-in-a-100-year” floods, as well as record heat. All of which suggests that even one degree of warming is not exactly safe. 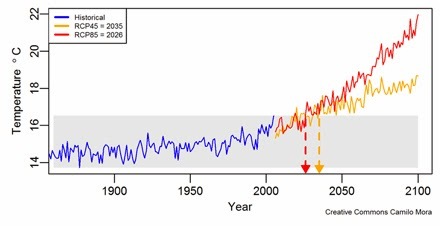 Yet carbon dioxide levels today are sufficient for one-and-a-half degrees of warming, and without rapid and deep emission cuts two degree will be unavoidable. We know quite a bit about a 2°C world from climate history research. Three million years ago in the mid-Pliocene, when greenhouse gas levels similar to today and sufficient for 2°C of warming, sea levels were 20 metres or more higher than today. Yet with a 5-metre rise, Miami would disappear and Central London, Bangkok, Bombay and Shanghai would lose most of their area. Rich food-growing deltas such as Nile, Mekong and Brahmaputra inundated. At 2°C warmer, every year in Australia would likely be hotter than the hottest year up to 2005; there would up to a doubling of days over 35°C, and roughly a doubling in extreme fire days. The barrier reef would be lost, Kakadu salinated, Murray Darling water flows down by about a quarter, and seas would be on the way to rising several metres in a nation where 85% of the population lives within 50 Kms of the coast. In Australia, more than $200 billion worth of coastal assets and 700,000 properties are at risk from a sea level rise of just 1.1 metre. What more can we do to connect the dots between today’s extreme experiences and tomorrow’s world?